Discounts and Novelties From Our ElcomShop! Dear friends, here we come with a set of novelties from our ElcomShop. We’ve made a few new designs and added new fancy products, such as long sleeve shirts for girls and baseball caps for boys and separately for dads 🙂 and mugs for everyone. All company designs applied to a wide and varied range of products can be found in our shop window. Good quality souvenirs from our shop will brighten your day and please your eyes. Placing an order is as easy as 1-2-3, simply choose an item, specify its color and size – and voila. And the best part of your order is that you don’t have to pay for delivery! 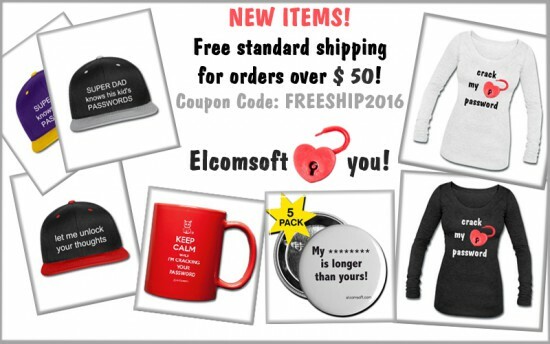 Yes, enjoy your absolutely free standard shipping for all orders over $50 till February 16, 2016. Use your exclusive coupon code FREESHIP2016 in order to save on delivery, and have a lovely shopping! This entry was posted on Friday, February 5th, 2016 at 5:44 pm	and is filed under Did you know that...?, Elcom-News, General. You can follow any responses to this entry through the RSS 2.0 feed. Both comments and pings are currently closed.